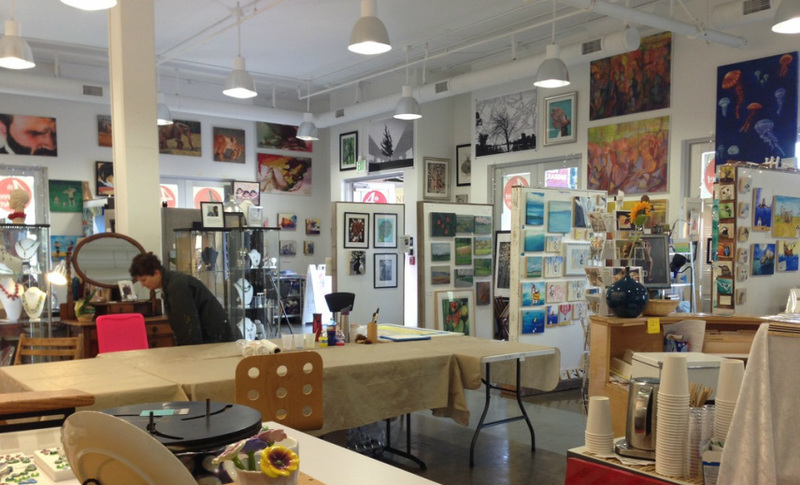 Would you like a space to both create and sell your art? We are looking to bring in a new artist! We are a cooperative studio/gallery located at the corner of Fourth Street and University Ave in Berkeley, CA. A couple blocks away is a bustling shopping district (Anthropologie, Apple, The Gardener, Madewell, and Title 9 are some of our neighbors). There are several artists in our well-lit studio. Painters, jewelry artists, and mixed media artists create, display, and sell their work here. We all take a turn as shop keeper once per month to keep our doors open to the public. We meet once a month to share pizza and talk about how to make our space better. We have a reception every month with rotating shows every 6 weeks. You're looking for a space to both create and sell your work. You're a painter, a print maker, or other type of visual artist. You don't mind pitching in to help keep the space looking nice, you're comfortable working with others to make decisions around keeping the space running, you play well with others. You've got a good understanding of the art business world, do a good job marketing your work, and have a mailing list (that you don't need to share with us, we just want to know that you'll actively participate in marketing efforts). Your work has a solid history of sales. We've found that pieces around the $100 mark sell well, but have sold plenty of pieces over to the $1000 mark. If you have experience organizing shows, tell us about it. If you're a pro at social marketing, send us links to where we can find you (facebook, twitter, instagram, etc). The space has a footprint of about 10 ft x 7 ft 6 inches. The rent in the studio is $304 per month. Move in requires an additional month's rent as a deposit, plus a non-refundable one time fee of $100 for materials (gallery supplies). We can divide up the deposit over a couple months if need be. Each member is asked to sign an our Artist Agreements as well as an acknowledgement of the gallery rules. The space is available to move in as early as February 1, 2019. You'll be able to work one shift per month (we are open to the public Friday - Sunday). You'll be able to participate in the community spirit of our gallery (attend meetings and receptions). You'll commit to being in the space for at least 3 months. The interview process is in two parts. First, please email us 4 JPEGs of your work, your resume, your artist statement, and a link to your website. If we think your work is a good fit for our space, we'll contact your for a group interview with some of our current artists. 1-2 weeks after that, we'll let you know if we would like you to join us. At that point, we would need to collect the deposit, first month's rent, and materials fee, in addition to our agreements. We'll then set you up for a training to go over the sales process, general tasks, and to get you comfortable with the space. Let us know your interest in the next 2 weeks and we can kick off the process. Thanks for signing up to be a prospective artist! We look forward to meeting you.